Toyota Kirloskar Motor Pvt. 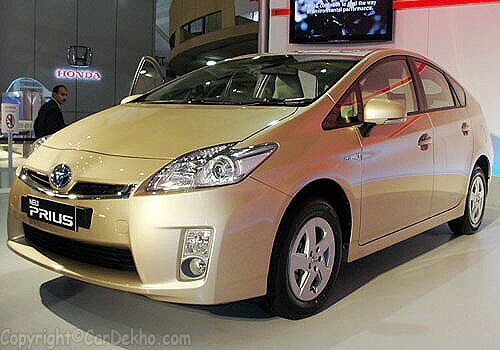 Ltd. (TKM) has launched its all new sedan models of Prius- a inaugural and global leader in Hybrid technology at the 11th Edition of Indian Auto Expo 2012. The new Toyota Prius price in India is tagged between Rs. 27,38,500 to RS. 29,40,500 (Ex showroom Delhi). This third generation vehicle was first introduced in Indian automotive industry in 2010. Not just delivering high fuel efficiency and low carbon emission but it mold a revolution in many ways such as new and advanced design, powerful driving performance and received great applause around the globe. Toyota brings Prius with the inclusion of various new features and the most interesting and latest innovation in advanced automotive technology is the Solar Ventilation System. This integrated feature is positioned on the moon roof, generating electricity and using it to circulate inside the cabin when the vehicles is packed. Another feature of the car is the Remote Air conditioning system allows you to automatically operate the air conditioning system of the car using remote control before entering the car. The new Toyota Prius comes with a newly designed sporty exterior which includes newly design front grille, front bonnet, new headlamps, turning indicator with ORVM retract, newly formulated LED tail lamps etc... The luxurious and roomy interior further enhances the usability of the car. The premium interior of the car includes new audio JBL 8 speaker with USB port and back monitor. At the event of launch, the Deputy managing director-commercial, TKM, company introduced new Prius sedan to bring in advanced automotive hybrid technology to India with an aim to increase the market value of Hybrid vehicles in the country. He also mentions that new Prius comes with more innovative technology which includes latest solar powered ventilation system.